Simon Stevin was a famous Dutch mathematician, physicist and engineer of the 16th century. He had a profound impact on mathematics, science and engineering as we know it today and has made a great many contributions in various fields. Stevin was an illegitimate child born in 1548 in Bruges. Very little is known about his personal life, particularly his childhood. Even the exact dates of his birth and death are uncertain. Stevin’s first professional pursuits were as a bookkeeper in Antwerp where he used the double entry method of record keeping based on the technique developed by an Italian mathematician named Pacioli a century before. Between 1571 and 1577 he travelled to many countries including Poland, Prussia and Norway. Stevin moved to Leiden in northern Netherlands at the age of 35 and attended university there. At university he met Prince Maurice of Nassau, who was the son of William of Orange. Maurice was impressed by Stevin’s intelligence and asked Stevin to become his official tutor. Thus the two became close friends. When William of Orange was assassinated, Prince Maurice was appointed the head of the army and Stevin became his strategic advisor. He was also managing the Prince’s estates and finances, and introduced the double entry method of accounting there as well. Simon Stevin has distinguished himself in several areas. He invented a carriage which had sails attached to it and would be driven by the force of the wind. Stevin and Prince Maurice, along with a party of 26 people used this carriage on the beach and it is said that the carriage was moving even faster than a normal horse bound carriage would. 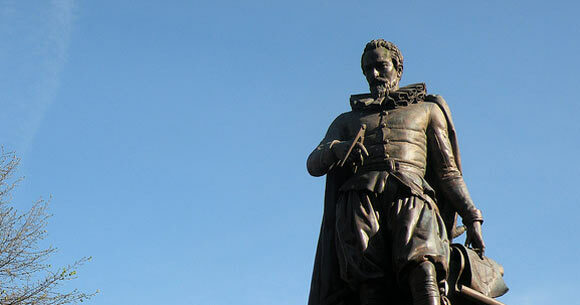 He invented a system of drainage which prevented flooding and improved the efficiency of windmills. He proposed several important mathematical and scientific theorems and was the author of 11 books. He favored the Dutch language above Latin and chose to write all his books in Dutch for the benefit of the common man such as merchants and traders. He believed Dutch was a superior language to communicate in and coined several Dutch terms in the field of science and mathematics (including the word for mathematics itself) that were not of Latin origin. Later, he even established a university at Leiden on the orders of Prince Maurice where instructions were given in Dutch rather than Latin. He was the first to disprove Galileo’s theory that objects of different masses will fall at different speeds by conducting his own experiments. He proposed the Hydrostatic Paradox which says that pressure is independent of volume and area, but is solely determined by the height of the vessel. He proposed the connection between lunar cycle and ocean tides. In one of his books titled “Arithmetic”, he introduced the concept of the quadratic equations to the Western world for the first time, a century after it had first been formulated in India. He also popularized the use of the decimal system and advocated its adoption in everyday life such as currency coins, measures and weights. He even played an important role in the development of real numbers. He wrote books on other subjects as well, including mechanics, optics, geography and astronomy. He even wrote a book called “Theory of the art of singing” and was the first to devise the concept of dividing the octave into 12 intervals. Simon Stevin married very late in life, close to the age of 60 and fathered two children. He achieved wealth, status and fame and his works have been translated into many languages. His works were always balanced between theoretical and practical knowledge. Stevin died in 1620 at the age of 72.